One blog I read is "Sew4Home"; it's all about making nifty things for your home and yourself. One recent entry was making a small purse. It was adorable. I have two daughters who are all about purses (and shoes, too, in case you were wondering). So, whenever I come across an interesting purse pattern or image, I save it to show them. Middle Daughter (DD#2) immediately loved it; youngest Daughter (DD#3) has reserved her opinion. Under normal circumstances, I really do try to do one project at a time, so that it has a reasonable expectation of getting done. I was already in the middle of a fairly large quilting project and I knew if I waited until the quilt was completed, I would 1) have forgotten about the purse or 2) remembered the purse but forgotten where I stored the pattern. So ... I put the large quilt project on hold and jumped into the Petite Purse Project. First order of business was finding the purse frame. Although I have made tote bags and drawstring bags and other bag-type things, I have never frolicked with a real honest-to-goodness metal purse frame. I ventured to my big fabric store, where they inventory everything that's anything. I knew they had purse making supplies because I remembered seeing them. I bought an antiqued silver frame. It had little, tiny holes along the frame and I had no idea what they were for. But, a purse frame is a purse frame, right? Oh my no. Especially the purse frame required for the Petite Purse. That frame is a really unusual one ... well, at least *I* had never seen a frame like it before nor had I ever seen a purse with that kind of frame. But, what I do I know? I'm not in the purse-making hobby. The frame I previously purchased at the big fabric store was *not* the kind the Petite Purse used nor could the pattern be adapted to accept the frame I purchased. Hmmm. I will simply keep it for another purse. Google search is a wonderful thing! I was able to find the exact frame required ... after looking through pages and pages and pages of websites. Apparently it is NOT a common frame! I feel fortunate to have found a source at Fabric.com and I bought a bright gold frame. See that horizonal rod? That's the key piece to this purse! 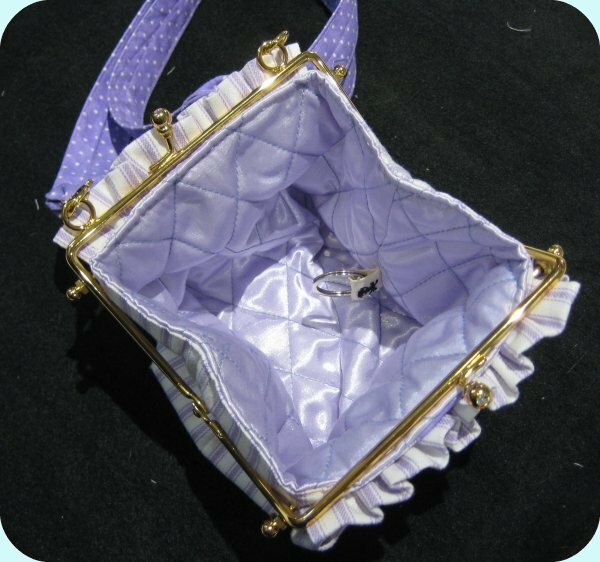 The purse body contains a casing that the rod goes through and attaches the purse to the frame. It *also* allows you to make multiple purse bodies and swap them to suit your mood. Another Google search led me to another source for the kind of SMALL swivel clasps that were in proportion to the Petite Purse and .. oh hallelujah! ... in bright gold. Who *knew* it would be a long and arduous search? This source is the wonderful Sewphisti-Cat Designs. The swivel clasp they had in stock was absolutely the perfect match! Now that I had all the hardware, I could proceed with the purse itself. I had some large-ish scraps of a woven stripe fabric that DD#2 simply loves. Fortunately, it was large enough to be the body of the purse. 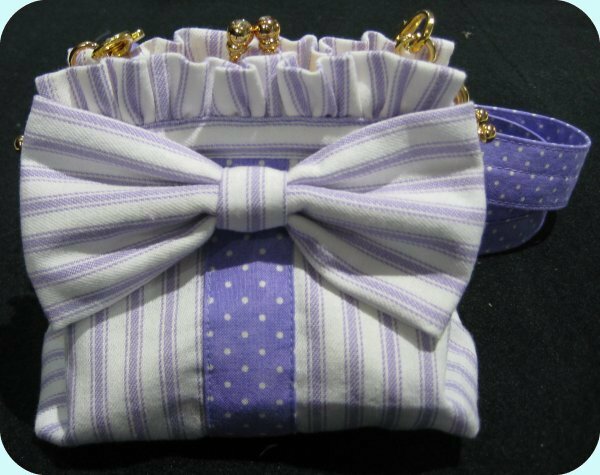 The tutorial for the purse is at Sew4Home's Petite Purse project. One thing I did differently was to quilt the lining fabric. 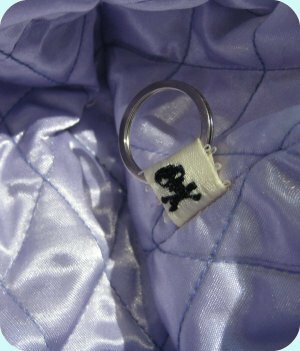 They didn't call for quilted lining fabric but the shiney satiny fabric I wanted to use was pretty flimsy on its own. 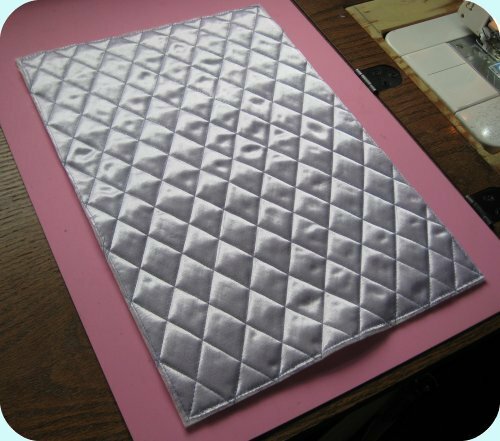 I did diamond quilting with thin batting to give the lining some body. 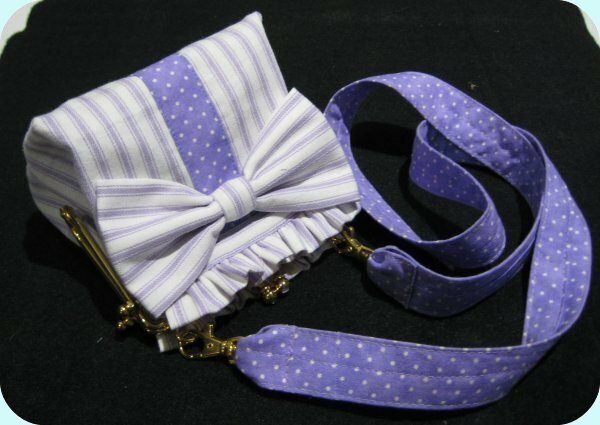 I think the shoulder strap I made is wider than they designed, but I wanted the strap to be sturdy, so I wrapped the strap fabric around a long piece of twill ribbon that I had .. the width of the strap was dictated by the twill ribbon. After DD#2 saw the purse (and was quite enthralled by it), she asked for a ring inside so she could attach her keys to it. That way, if she dumped the purse over, at least the keys wouldn't get lost. Unfornately, putting in a ring meant ripping open the side seam .. arrggh! But, that also gave me the opporunity to use one of my pirate tags, which I had kinda forgotten about. I'm never quite sure that my hand-stitching will hold as well as machine stitching, so I sewed the opening back up several times and tugged on the tag. As for the size .... the tutorial says right up front that this is a 5" square purse. FIVE INCHES SQUARE. You can't get much more factual than that. However, my visualization wasn't working very well at the time so I really did NOT imagine how small this purse really is. Go look at a charm square .. that's 5"x5" .. and that is about the size of this purse!